Brains and bullets, the perfect match. Life as a brain in a jar is pretty boring. So, you decide to break out. Realizing there's not much you can do with all that gray matter and no arms or legs, you decide a delicious mech suit will suit your escape purposes quite nicely. 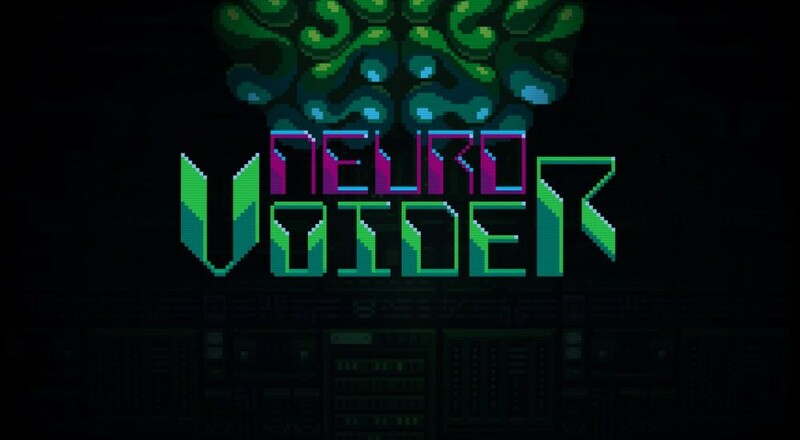 Thus begins NeuroVoider, an intense dual stick rogue-lite shooter with a high level of difficulty and a slick couch co-op mode built right in. 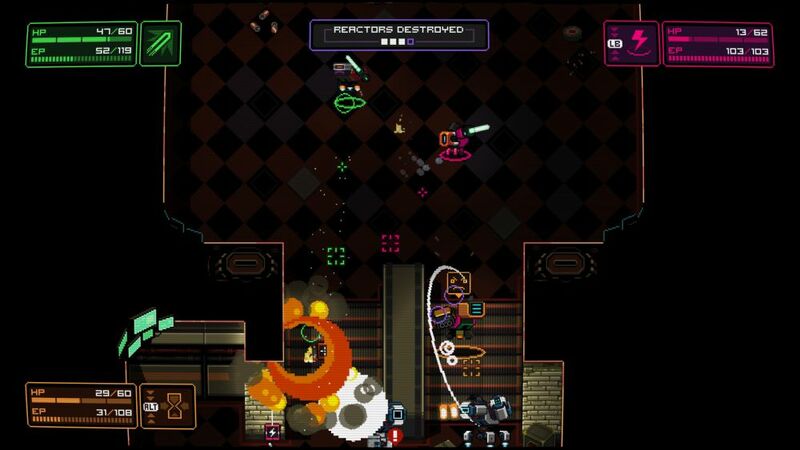 NeuroVoider can be summed up in two words: shooting and looting. The game sends pile upon pile of enemies at you, each armed with bright, speedy bullets and painful weaponry. Using your suit's own abilities, you'll dispatch these foes one group at a time, working your way through a series of randomly generated levels that get progressively larger and more difficult to complete. Along the way you'll pick up loads of scraps and loot, both useful for outfitting your mech to survive the waves of baddies to come. When starting a new round of NeuroVoider, your first act will be to choose a mech. Dash, Rampage and Fortress each have their own playing styles roughly corresponding to speed, attack, and defense, though in practice it's much more nuanced than that. Mechs have two different guns and a couple of special attacks to unleash, all of which deplete an energy meter if used too frequently. This forces you to do more than just press the shoot button until everything dies. 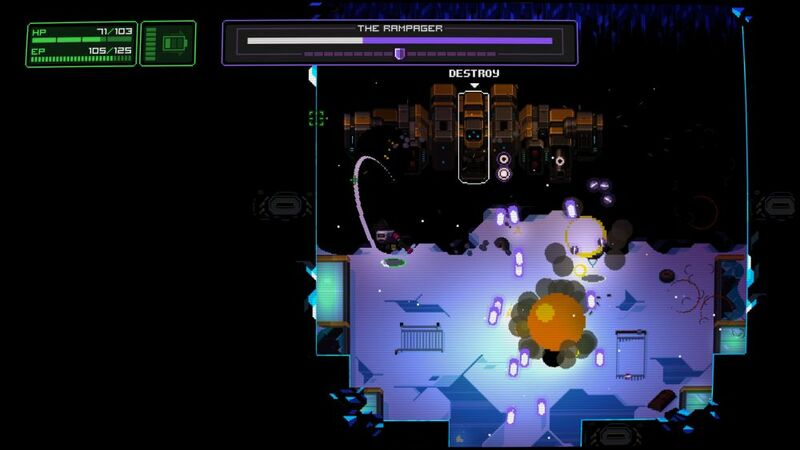 NeuroVoider makes you play smart, even on the lowest difficulty level. Furthering the load-out customization is a set of 25 skills you can equip before heading into the game. Scroll through the list and decide which one suits your style. Everything from health regen bonuses to loot boosters is available. You can only pick one, but don't worry, you'll be dying soon enough, and in NeuroVoider, when you die, you start all over again. Hooray for rogue-lites! The main flow of the game drops you in a level with the simple goal of destroying all of the reactors. There are usually only a couple to be found, but getting there is most of the battle, since levels are packed full of things that want you to be dead. Defeated enemies and certain crates hide scraps and loot. While fighting for your life, be sure to pick up as much of these as you can. Half of the NeuroVoider experience is centered around tinkering with upgrades. After completing a level you'll engage in what NeuroVoider calls an "intermission". Intermissions give you a chance to repair and upgrade your mech using the scraps and loot you just picked up. Scroll through the list and choose an item you like, whether it be an HP upgrade, mobility upgrades, or a new gun for your left or right slots. A lot of the items you'll find will be for a different mech than the one you're playing, but don't worry, you can scrap things you don't need and use the parts to create your own upgrades. Intermissions usually turn into lengthy diversions, but hey, who doesn't like equipping new stuff? Page created in 0.9301 seconds.